Rainforest Cafe does all that it can to make every guest’s visit an enjoyable and comfortable one. Please let us know in advance of any accessibility requirements you might have by making a priority seating over the phone on 020 7434 3111. 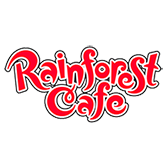 On arriving at Rainforest Cafe a member of the team will assist our wheelchair users to London Trocadero’s wheelchair access area, which does involve leaving the building and is just minutes away. We will ensure there is sufficient space given to dine on our lower floor (Forest Floor) as wheelchair access is not available to the middle floor. At off peak times, please note that wheelchair users and their guests may be the only people located on this level. Forest Floor is decorated with jungle foliage, waterfalls, a fresh water aquarium and of course sound and light effects can still be enjoyed here. This area is also fitted with disability access toilets, with emergency call alarms and a wheelchair is available for internal use if required. For safety & legal reasons, we are only allowed to accept 2 wheelchairs in the building at any time. We also limit the number of guests into the restaurant to prevent overcrowding. Due to the theme of the restaurant, please be aware that loud noise and strobe lighting is used to simulate storms every 29 minutes. There are also times when low lighting levels are in use. Our Retail Village is fully accessible to all guests and is found at the entrance to Rainforest Cafe. Please feel free to ask any of our hosts if you require any assistance, they will be happy to help. The middle floor of Rainforest Cafe is the main dining area and has 25 steps from the Retail Village to the Mushroom Bar. Toilets on this level also have steps to access these facilities. Piccadilly Circus Station does not have step free access from trains to street level. As an alternative, please check the Transport for London Accessibility website for details of the many bus routes that service the Piccadilly Circus area.